A Short Sale is a sale of Real Estate in which the proceeds from the sale fall short of the balance owed on a loan secured by the property owner. In a Short Sale, the bank or the mortgage lending institution agrees to discount a loan balance due to financial hardship on the part of the borrower. To view the comparison chart between Foreclosure and Short Sale [click here]. 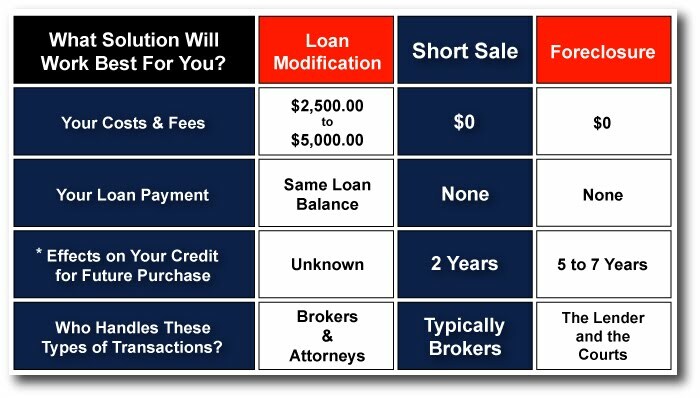 The major difference between the 2 choices is that in a successful Loan Modification, you retain your home; whereas in a successful Short Sale, you will move upon the close of escrow. It's vitally important to understand that the bank or mortgage lending institution can deny both. With this understanding, watch for brokers and/or attorneys claiming that they have inside connections with the decision makers. These individuals / entities should be reported to the California Department of Real Estate (DRE) and/or The State of California Bar Association. We encourage you to visit our page titled ABOUT LOAN MODIFICATION, where we provide numerous direct resources (links) with the DRE and The State of California Bar Association. Both the Short Sale and Loan Modification will affect your credit report and credit score. In most cases, individuals seeking Loan Modification are required to be delinquent on their mortgage - which in itself will affect credit scoring significantly. Both options require proof of financial hardship - which is often enough a delinquent mortgage. SUNBURST advocates the Short Sale transaction. We do not provide Loan Modification services. Your individual circumstances will dictate the best possible direction. For many who purchased at the height of the market, it will be a great challenge to maintain their mortgage payment - with or without a reduction in their monthly payment. Real estate values will eventually stabilize and homeowners will eventually return to an equity position. However, that could take a significant amount of time. A successful Short Sale will cost $0.00. The effects on your credit will likely be more harsh than from Loan Modification - but nowhere nearly as bad as if you sat on your hands and allowed a foreclosure to occur. With the shrinking credit industry, it is more mindful than ever to protect your credit report and credit score. * A Foreclosure could have lasting implications for up to 10 years. Absolutely NO FEES or cost to you. In cases where there is 2nd trust deeds, fees and/or costs may occur. Can get you out from under a major debt that you cannot currently afford - with no future recourse. Allows you to stay in your home longer and gives you more control over your ‘move out’ date. Not nearly as harsh on your credit report as a Foreclosure - In fact, may allow you to purchase new home within 2 years. Judgments, liens and other deficiency amounts may be negotiated while in escrow (including IRS and franchise tax liens). If Only There Was a Giant 'RESET' Button! 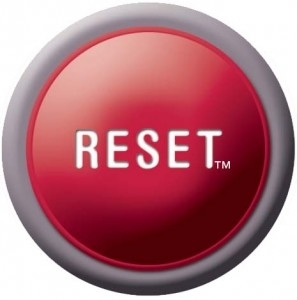 Unfortunately, there is no magic RESET button that we can just push to make things go back to the way they once were. In reality, the RESET button (or Short Sale transaction) is a meticulous manual process that can (if completed successfully) alleviate your major financial burden. It's a 'best case scenario' solution that will not likely be cut and dry. And, it can and will likely create some new (more manageable) financial and/or credit related burdens / obligations. In the end, a successful Short Sale will end one negative situation and RESET your financial positioning for future real estate ownership. Unless the bank or lender significantly reduces principal balance and simultaneously provides suitable (new) loan terms, Loan Modification as a workable solution may prove to be a temporary solution at best.